This article is about the Brawl stage for multiplayer use. For the Subspace Emissary side-scrolling stage, see Skyworld (SSE). Skyworld as it appears in Smash. Skyworld (天空界, Skyworld) is a stage from the Kid Icarus series in Super Smash Bros. Brawl, Super Smash Bros. for Wii U, and Super Smash Bros. Ultimate. Pit is fought here for his unlock battle in Ultimate. 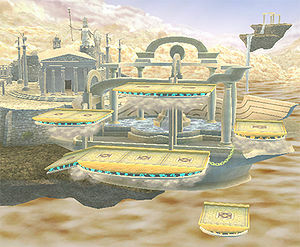 The stage consists of four floating cloud platforms, arranged in a pattern somewhat resembling Battlefield, which each have sets of yellow stone platforms resting on them. The right-most platform is connected to the bottom one by a chain, and can raise and move right, or fall and move left. An additional stone platform occasionally appears, moving horizontally below the stage, from one end of the screen to the other. All of the stone platforms are solid and cannot be passed through, and there are grabbable edges on the far ends of each set. All of them except for the one that moves underneath the stage can be individually attacked, showing visible cracks after taking some damage, and will break if they are damaged enough. In addition to player attacks, the platforms can be damaged and broken by items such as Bob-ombs, Hammers, and Assist Trophy or Poké Ball summons. If a platform is broken, the cloud underneath it will serve as the new platform. The clouds act as soft platforms, but unlike any other platforms in the game, players can pass through these clouds from above in powerful knockback from a meteor smash or stage spike. The clouds do not have any grabbable edges. After a certain amount of time, the breakable stone platforms will regenerate. If the stone platforms at the edges are broken, this can hinder players' recoveries, as the clouds do not have grabbable edges on them. The moving platform below the stage can boost recovery, by giving players ground where there is normally none. In Super Smash Bros. for Wii U, the Ω form features only one flat yellow platform. Unlike the normal form, this platform is not breakable. In Super Smash Bros. Ultimate, the Ω form and Battlefield form are similar to SSB4's Ω form; however, the main platform is resized and reshaped to match Final Destination and Battlefield, respectively, and the main stage platform resembles the platform designs of the normal form. The three soft platforms of the Battlefield form resemble the yellow stone platforms of the normal form. Skyworld as it originally appeared in Kid Icarus. Skyworld is the third level of Kid Icarus and its sequel Kid Icarus: Of Myths and Monsters. The majority of the elements in this stage are original to Smash and have no origin, with a few exceptions: In Kid Icarus, some of Skyworld's platforms are stone, and some are clouds. Throughout the level, there are columns that go through the cloud platforms and support some of the stone platforms. In this stage, the main platforms are made out of clouds with destructible stone platforms on top. In the background, numerous columns can be seen. Kid Icarus also includes floating platforms that go from one side of the level to the other, which Pit can use to his advantage to reach his destination. In Smash, there are times where a floating platform towards the bottom of the stage will go from the left side of the stage to the right. 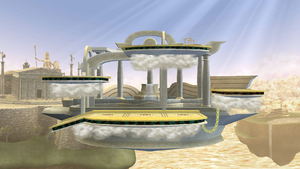 A temple, likely referencing the Palace of the Sky, can be seen in the background on the left side; it also includes a statue of Palutena, more closely resembling her original design than her Brawl redesign. The stage is banned in most competitive tournaments, as the unbroken platforms can create a cave of life, allowing for teching players to survive to unusually high damage percentages. Additionally, the unique platforms cause an over-reliance on stage spikes. One of them concerns Mr. Game & Watch. If the player plays as him, breaks the middle section of the main platform, and walks towards one of the platforms on either side of the new empty space, the player will drop through the cloud, as if they had smashed the Control Stick down. However, even if he just walks towards either platform, he will still drop through. Another can be performed on this stage with Meta Knight. When using his side special, Drill Rush, aiming up into a breakable platform causes Meta Knight to appear above the platform once the move has been finished. Another one involves a Hothead. If the left side of the highest platform is destroyed, the Hothead will rapidly move back and forth on the right side's top left corner while it circles clockwise. Link, Pit and Samus breaking the stone platforms. Donkey Kong meteor smashing Wario through the bottom cloud. Skyworld in Super Smash Bros. for Wii U. The floating island in the background has a palace on it with a statue behind it. The Kid Icarus series playable characters on Skyworld in Ultimate. Bowser in his blue alternate costume next to a Spiny Shell on the stage. Donkey Kong using Spinning Kong on the stage. Ike using his neutral aerial on the stage. Isabelle Pocketing Mario's Fireball on the stage. Link attacking Ganondorf on the stage. Lucas using PSI Magnet near a Black Hole on the stage. Mario in his alternate costume based off his wedding outfit from Super Mario Odyssey with Peach in her white alternate costume on the stage. Marth using his up taunt on the stage. Meta Knight and Kirby in his dark alternate costume on the stage. Mii Brawler using Head-On Assault on Kirby's Stone form based on a treasure chest from The Legend of Zelda: Breath of the Wild on the stage. Squirtle, Ivysaur, and Charizard on the stage. Sonic using his up tilt on R.O.B. on the stage. Green and yellow Yoshi on the stage. Young Link with Toon Link's fairy on the stage. Marth idling on the stage. 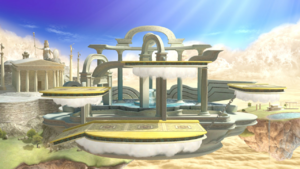 Ironically, Pit's Final Smash in Brawl, Palutena's Army, is hindered in its effectiveness when used on this stage. The Centurions hit the breakable stone platforms and are knocked out of flight, allowing characters with a fast enough spot dodge to completely dodge the attack. In the Super Smash Bros. for Wii U 50-Fact Extravaganza, this stage is mistakenly labeled as part of the Zelda universe. In this case, it may have been confused with Skyloft, which is part of the Zelda universe. One of the floating islands in the background features a temple with a Palutena statue. This statue is modeled after her artwork from the first Kid Icarus game. The game logo for this stage's My Music screen has been different in every game it has appeared in: in Brawl, the logo was taken from the Kid Icarus title screen, in For Wii U it was a modified Kid Icarus: Uprising logo, and in Ultimate the logo was taken from the original Kid Icarus box art. In Ultimate, there's a glitch where the right platform doesn't have a ceiling, meaning characters can pass through it from underneath. This page was last edited on April 16, 2019, at 08:32.